No rain, no rainbow. But when it comes to Southern California, you gladly rephrase this adage. No rain, no wildflowers! With excessive California super bloom, this new saying becomes a reality of the golden state. Thanks to seasonal rainfall that lasted for a few months, California hills and mountains have experienced unprecedented bloom. This trend hasn’t escaped Los Angeles and its surrounding area. Here the land that usually bears little to no sign of lush vegetation has been covered with bright colors. But before we dive into places to see wildflowers near Los Angeles, let’s talk about California super bloom. What is California Super Bloom? A super bloom is a term used to describe an explosive wildflower bloom unusual for a particular area. Typically, California faces this phenomenon once in ten years. However, with current climate change, California super bloom occurred twice for the past few years. The last time, it happened in 2017, followed by very dry year and practically no wildflowers. 2019 brought a lot of rain and thus an explosion of flowers. And with that, California looks completely transformed. Its desert landscape has turned into green pastures and colorful fields of flowers. 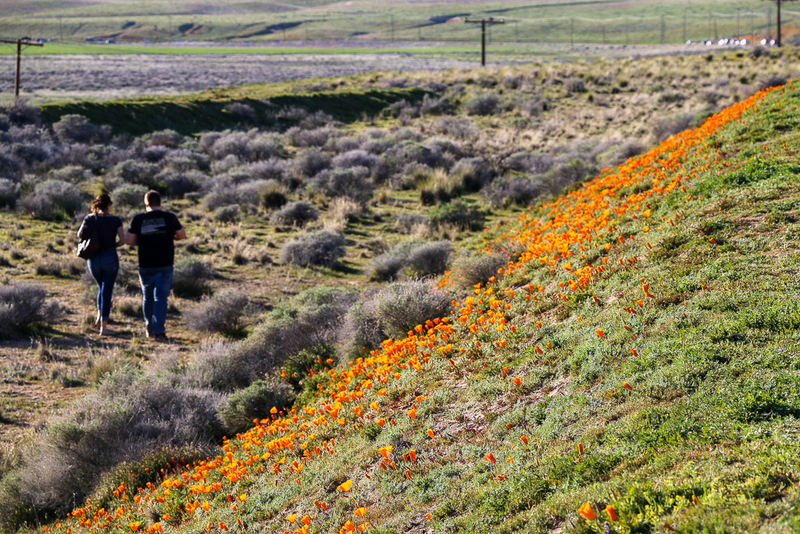 Poppies, primroses, and lilies have covered a normally barren-looking California terrain. If you’re happened to be near Los Angeles at this time, make sure to check out this phenomenal super bloom. 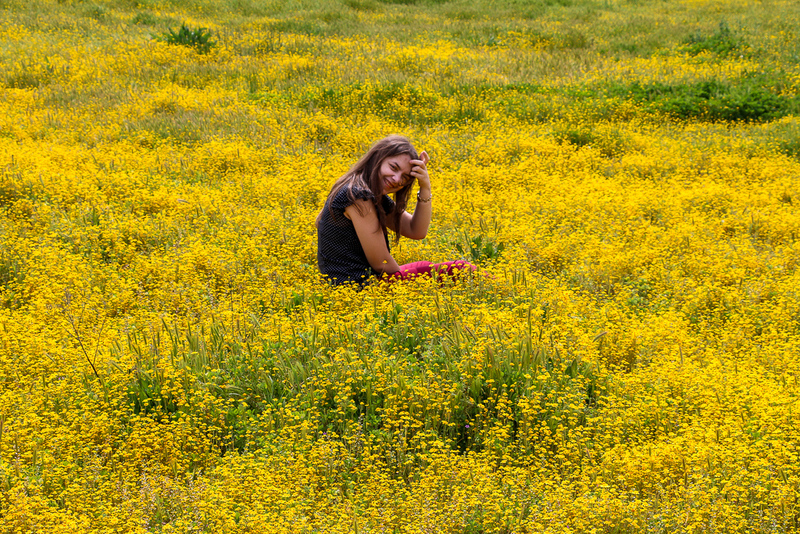 Located 1.5 hours from the Hollywood capital, Lake Elsinore is one of the most popular places to see wildflowers near Los Angeles. Technically, you don’t even need to drive to the town. The poppies fields have covered California hills for miles and miles before reaching the official place. It looks like orange fires have flooded the area occasionally giving a “green break” to the land and your eyes. However, you might want to restrain yourself from seeing wildflowers at Lake Elsinore’s Walker Canyon on weekends. During this time, the area is unbelievably crowded. It can take up to a few hours to get to visitor’s parking lot, moreover find an empty spot. 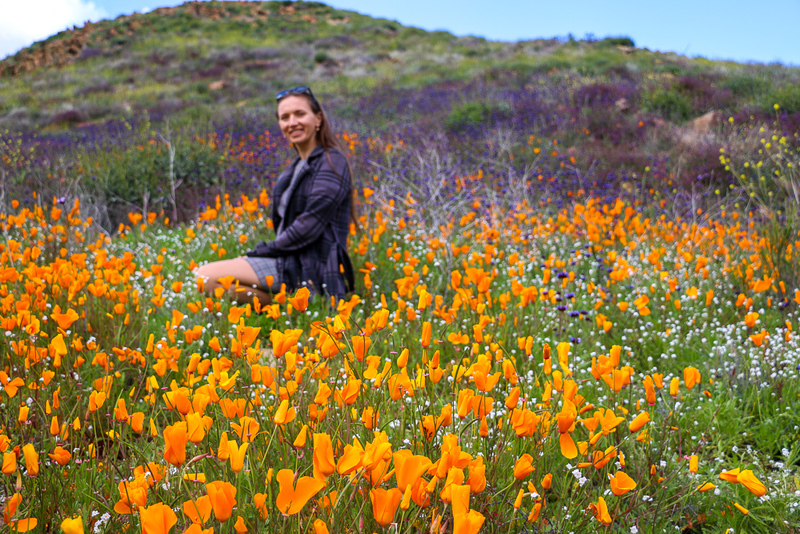 Antelope Valley California Poppy Reserve doesn’t go far from Lake Elsinore as one of the best places to see wildflowers near Los Angeles. Moreover, the place harbors the most consistent blooms of California poppies. (Although, the flower bloom doesn’t happen every year. 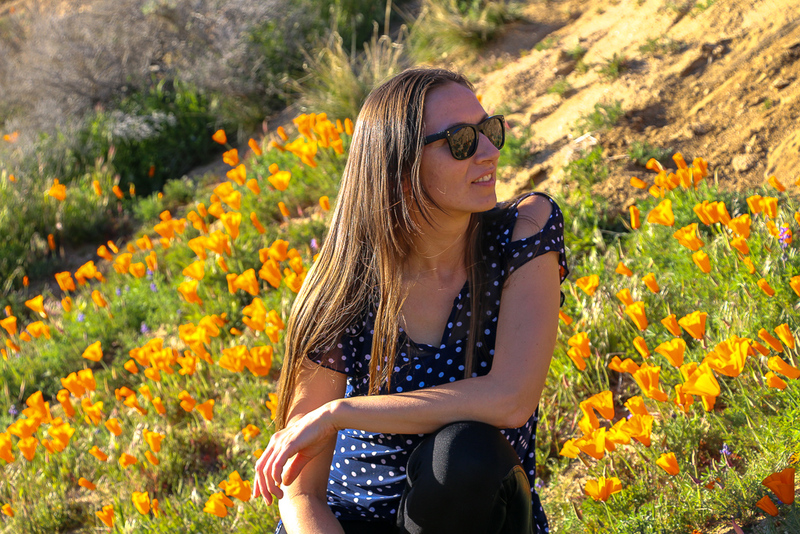 Here is our experience at Antelope Valley California Poppy Reserve last year.) The poppies usually bloom from March through May creating plenty of opportunities to enjoy the bright colors of California. Excessive rainfall brought colors to the oceanside as well. Thanks to it, now don’t need to drive long hours to see wildflowers near Los Angeles. The area near Malibu has turned into peculiar front gardens with pop-ups of yellow, orange, and lilac colors. One of the best places to witness California super bloom is El Matador Beach. If caves and rocks of the beach attract you throughout the year, wildflowers steal the show in spring. Splashes of yellow color have appeared on the cliffs adding extra charm to one of the most photographic beaches in Los Angeles. Point Dume State Beach expands your experience with wildflowers near the ocean in Los Angeles area. On top of stunning vistas, the beach has a wild range of the flowers on display. 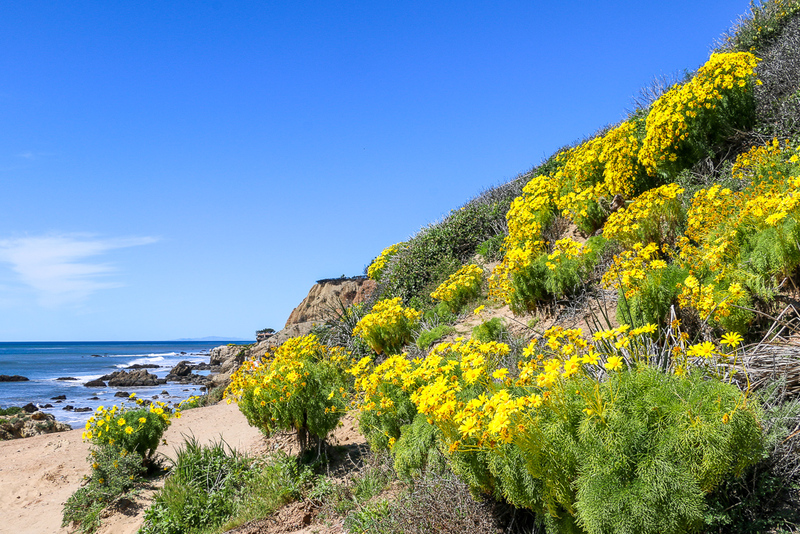 Giant coreopsis, bush sunflowers, and California popies have covered the bluffs and headlands of the beach. Sand verbena, morning glories, and evening primrose have comfortably grown near the trails crawling up the hill. Paramount Ranch used to entice with its film legacy, a place where many Hollywood Westerns were shot. Sadly, with the massive fires in 2018, the ranch was burned down. But this fact didn’t spot people from visiting the place. This time, however, the wildflowers are the center of attention. Thanks to heavy rainfall earlier this year, the hills behind the ranch have been rejuvenated with lush greenery and humble wildflowers. Dense yellow blanket have covered a small field near the parking lot untouched by the fire. 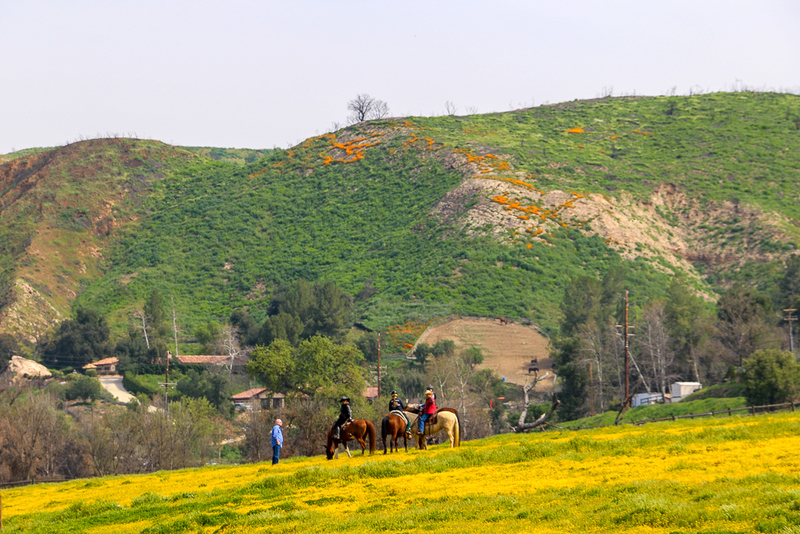 Paramount Ranch, however, is not only a place where you can see wildflowers near Los Angeles. Due to its gorgeous surroundings, it’s a perfect destination to perfect your horse riding skills.